Whether it’s your very first DIY move or your twenty first, Mobile Truck Rental have everything you require to ensure a smooth and trouble-free move, at a smidgen of the cost you could expect to pay if hiring a removalist. Our 3 tonne Pantech trucks are a fantastic choice for both personal and commercial duties. The greatest thing about our trucks is that you don’t require a truck licence to operate one. As long as you have a valid C class open licence, you’re free to drive one. Beyond this, they’re all automatic, as well, so anyone can drive them. For a superb deal on removal truck hire throughout Townsville, contact the friendly staff at Mobile Truck Rental now on 1300 799 317, simply fill out our quote form, or email us directly at info@mobiletruckrental.com.au . Normally, with a oneway rental, it’s up to the customer to return the vehicle back to the company’s closest rental yard, at the end of the rental period. At Mobile Truck Rental, we do the leg work for you. We deliver the removal truck to your address at the commencement of your lease and collect it from you at your new location, at the end. It’s the ultimate convenience, saving you time and money. We understand the essential role that customer service plays in defining the overall experience and determining our customers’ overall opinion of our company. Word of mouth plays a big role in the success and failure of every business, so we always go the extra mile to ensure that our customers are treated with the highest level of courtesy and professionalism. And if ever something does arise during your travels or if you simply need a question answered, where right here to take your calls, answer questions and provide immediate assistance. Our removal trucks have been purpose built to shift your belongings, safely and securely. Each truck is fitted with the latest technologies and creature comforts, including 500kg rear tailgate lifter, rope and trolley. The cab provides enough room for 3 adults to travel in total comfort and is fully air-conditioned, so you’ll be nice and cool during your travels, even if it is a sweltering summer in Townsville. Customer safety is our chief concern and our entire fleet is subjected to meticulous maintenance checks by trade certified mechanics. No truck is ever sent back to a rental yard, until it is has passed all required checks. Each Pantech vehicle is able to transport 20m³ worth of equipment in a single journey, which is approximately the size of the contents of an average 3 bedroom apartment. Our trucks have been specially engineered to ensure that the loading and unloading of your belongings is as effortless as possible. For those who are new to DIY moves, we recommend you take a look at our useful guide on lifting heavy objects and loading and unloading to prevent unnecessary injury. Our personalised removal truck hire deals represent tremendous value, allowing you to relocate to your new address at a fraction of what you’d pay for a removalist to do it for you. Also, because we collect the vehicle from your address and retrieve it from your new location, it saves you from having to go out of your way to visit the rental yard at the beginning and end of the lease period. With a DIY move, you dictate the pace of the move, helping to alleviate any stress involved. Also, as you’re the one tasked with the loading and transporting of your belongings, you can be certain that your particularly fragile and valuable items will be treated with the special care that they deserve. Removalists on the other hand, operate on a tight schedule and only interested in getting your goods to their new location in the quickest possible time. The best thing about hiring one of our removal trucks is that you don’t require an actual truck licence to drive one. Just a standard C class open licence is all you require to drive one. Better still, they’re all automatic, so even those unfamiliar with a manual can operate our trucks with ease. Even though they’re slightly bigger than your typical passenger vehicle, when you rent one, you’ll quickly discover that they’re just easy to drive. That said, if it is your first time driving one, please take the time to read our driving tips guide, to help ensure a safer trip. 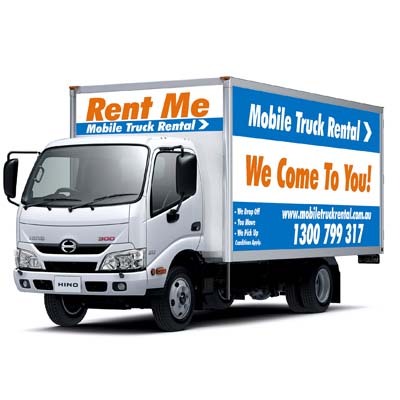 At Mobile Truck Rental, we make Townsville removal truck hire affordable. Our vehicles are all immaculately clean, maintained and serviced on a frequent basis and come fully equipped with all the gadgets you need to perform your transport duties in total comfort. Competitive rates with no hidden charges. Avoid paying outrageous sums of money to have a removalist do the work for you. Do the smart thing and Hire a Townsville removal truck. You’ll be saving yourself a small fortune by doing so and our super convenient service ensures that you don’t have to waste time and money driving to the rental site to collect your vehicle or driving to another one when you reach your final destination.